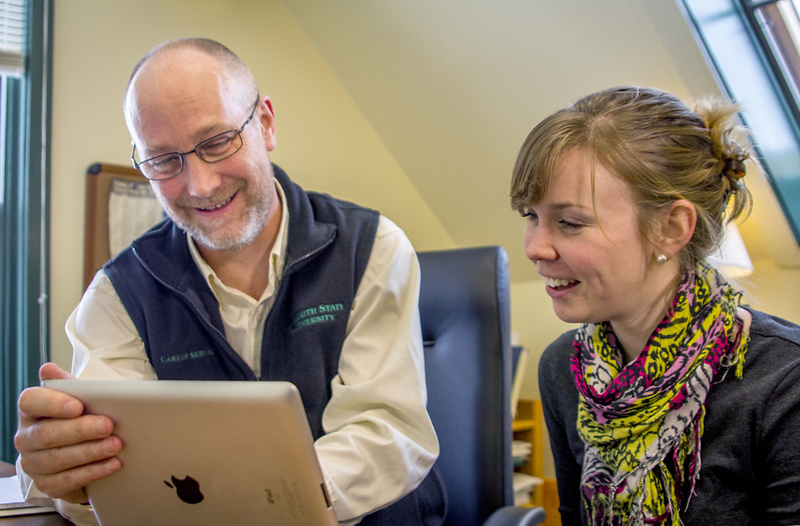 “Bringing students and alumni together allows for real and meaningful connections,” says Jim Kuras, Plymouth State’s new career services manager. With more than 20 years of career services experience, Kuras has seen significant changes in the way career services are delivered on college campuses, especially with the rise of social media. Kuras teaches a section of Professional Employment for PSU’s College of Business Administration, a course designed to help students develop the skills needed to succeed in the workplace, such as professional behavior, networking, and the job search. He quickly realized that the class would be the perfect opportunity to explore the possibilities of pairing undergraduate students with alumni mentors at Plymouth State. This spring, Kuras put the idea into motion with a small pilot group. “During their degree programs, students develop leadership, relationship building, critical thinking, communication, and other skills,” says Kuras. “Alumni mentors can help students understand how portable those skills are, and how they can leverage what they’ve learned at Plymouth State throughout their careers.” Students and alumni mentors meet virtually or in-person, depending on the alumni mentor’s location, three or four times throughout the semester. Consider getting more involved with Plymouth State students as an alumni mentor. Learn more from Jim about career services at Plymouth State and opportunities for alumni to volunteer.